Heavy Duty Automotive Design Key Cabinet. 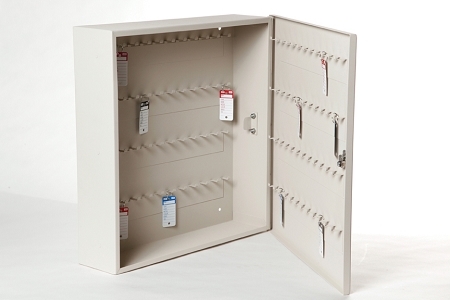 Large key hooks and extra space make this cabinet ideal for large keys with remotes. 18 gauge construction. Size is 21" x 20" x 5". Holds 96 keys - additional panel enlarges to 192 keys (sold separately). Neutral light Putty color. Convenient 1" hooks for key rings.2 lock keys per cabinet. Piano hinged. Packaged 1 per box.